The Board of Trustees of Fielding Graduate University recently elected Dr. Sandra McCord Best of Savannah to the executive board as Treasurer. In this role, she will monitor an annual operating budget in excess of 25 million dollars. Dr. Best was elected at the May, 2009 Board of Trustees Meeting held in Santa Barbara, CA. 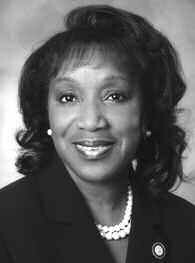 She was originally elected to the Board in 2002 and has served on various committees. Her professional career has included leadership positions in the private sector, in local and state government. She is currently Chief Human Resources Officer for Savannah State University and serves as a member of the President’s Cabinet. In Savannah, she serves on the Executive Committee for the local NAACP, as Chairman of the Board for the Consumer Credit Counseling Service of the Savannah Area, Inc. and a member of Delta Sigma Theta, Inc. Savannah Alumnae Chapter. Dr. Best is married to (retired) Captain Robert E. Best, Chatham County Sheriffs Department. An alumnus of Leadership Savannah, Dr. Best received her undergraduate degrees from Savannah State University and her doctorate of Educational Leadership from Fielding Graduate University, a nationally accredited institute of higher education.